Days later, she says, he picked her up around the corner from her house in Gadsden, drove her about 30 minutes to his home in the woods, told her how pretty she was and kissed her. On a second visit, she says, he took off her shirt and pants and removed his clothes. He touched her over her bra and underpants, she says, and guided her hand to touch him over his underwear. Two of Corfman’s childhood friends say she told them at the time that she was seeing an older man, and one says Corfman identified the man as Moore. Wells says her daughter told her about the encounter more than a decade later, as Moore was becoming more prominent as a local judge. 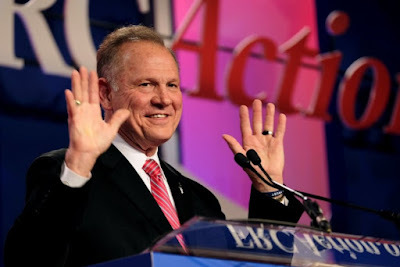 Aside from Corfman, three other women interviewed by The Washington Post in recent weeks say Moore pursued them when they were between the ages of 16 and 18 and he was in his early 30s, episodes they say they found flattering at the time, but troubling as they got older. None of the women say that Moore forced them into any sort of relationship or sexual contact. In a written statement, Moore denied the allegations. It is unfortunate that how many of us think about these allegations will almost certainly be colored by how we think of the politically reactionary Roy Moore. It is even more "unfortunate" that some men (or women for that matter) find themselves unwilling to live within the constraints of the law when it comes to the age of their sexual partners. Age of consent ranges from 16 to 18 in the United States. Adults should be able to abide by that. And if they can't they ought to go to jail for a little more than a minute. I don't know whether Moore did these things or not. I do know that there is a special election on December 12 for an Alabama Senate seat. Will voters in Alabama think that this is a media smear of a good Christian man or will they recoil in horror from a child molester. We'll just have to wait and see. I don't want to live in a world where accusations equal proof. I also don't want to live in a world where adults are getting away with molesting children.